A student died after being stabbed at Bowie State University, and her roommate is now in custody. Police received a report of a stabbing at the Christa McAuliffe Residential Center about 8 p.m. Thursday. The victim, Dominique T. Frazier, 18, was taken to an area hospital, where she died from her injuries. Frazier (pictured above, right) was a student at Bowie State who resided on campus. She was from Washington, D.C., and would have turned 19 on Sunday. Frazier was an honors graduate of Friendship Collegiate Academy on Minnesota Avenue N.E. The suspect, Alexis D. Simpson, has been charged with first-degree murder, second-degree murder and first-degree assault. Simpson (pictured above, left) is a 19-year-old student at Bowie State University and was Frazier's roommate. A teen from District Heights, Md., has been charged with murder in the stabbing death of her roommate at Bowie State University. "I didn't mean to do it, you all don't know what I've been through, you all jumped me," Simpson allegedly said to witnesses after the stabbing, according to charging documents. A neighbor of Simpson's mother said today that Alexis Simpson was often bullied by other teens in the neighborhood because of her light complexion and because she was a high achiever. Both the victim and suspect were second-year students at Bowie State, but were considered freshmen due to the number of credits they'd completed. Students, faculty and staff at Bowie State University are trying to cope with the murder of a student -- allegedly at the hands of her roommate. 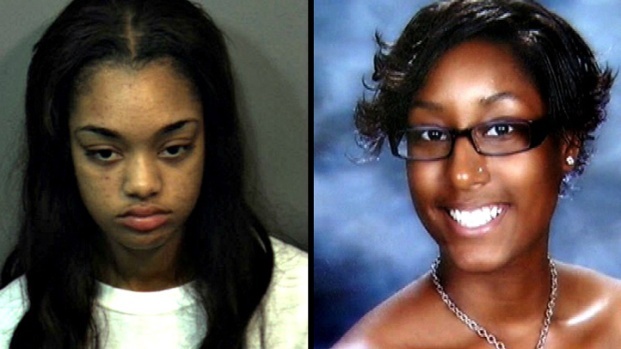 Simpson is being held in the Prince George's County Detention Center without bond. Maryland State Police investigators obtained a search warrant for the residential suite shared by the victim, suspect and two other students. There are four individual bedrooms in the suite, with two bathrooms, a kitchen and a common area. The suite is being processed for evidence today by crime scene technicians. Police also searched the District Heights, Md., house where Simpson had lived with her mother until leaving for college. A witness describes what she saw and heard during a fatal stabbing at Bowie State University. Investigators continue to conduct interviews and process evidence and information. The preliminary investigation indicates the victim and suspect became involved in an argument in their suite that escalated into a physical confrontation. 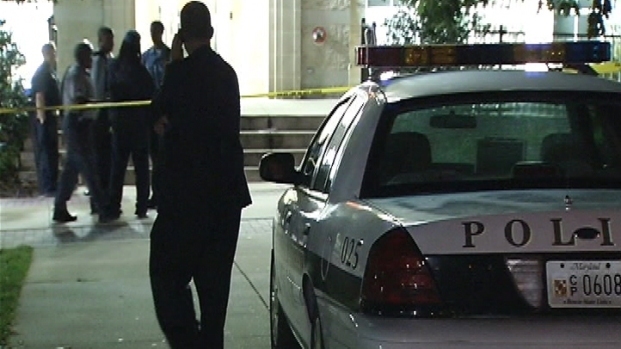 Witnesses told authorities that the victim and suspect had been arguing during the past week. They told authorities that they had been with Frazier and Simpson in their room Thursday evening, getting ready to attend a school-sponsored comedy show. The Bowie State community reacts to a fatal stabbing on campus. The incident began when the suspect, Simpson, turned off the music playing on Frazier's iPod. Witnesses said they asked her to turn the music back on, but Simpson said no. The victim, Frazier, then came out of her bedroom and began to argue with Simpson, which turned into a physical altercation, and a witness was injured when she tried to separate them. That witness pushed Simpson into her bedroom and shut the door. However, a few minutes later, witnesses said, Simpson came out of her bedroom holding what appeared to be a knife and entered Frazier's bedroom. She swung her arm toward Frazier "as if she was punching her," charging documents say -- but instead, Frazier had been cut in the throat. Frazier staggered out of the apartment and collapsed on a hallway floor, where she was found by Bowie State University Police Department officers. She was bleeding from the upper torso and was unconscious. Officers provided emergency care until EMS units from the Prince George’s County Fire Department arrived. The victim was then transported to Prince George’s Hospital Center, where she was pronounced dead at about 8:45 p.m.
Investigators believe Simpson left the campus after the assault. At about midnight, she turned herself in to officers at the Prince George's County Police Department District 3. At Bowie State University, all Friday classes were canceled, and a community gathering took place at noon at the Leonidas James Physical Education Complex. Counselors from the University Counseling Center are on hand to assist any students or staff in need of support. This week is homecoming week at Bowie State. Several planned events will still take place tonight.